Awesome or Off-Putting is a weekly delve into cryptozoology, ufology, aliens, medical marvels, scientific wonders, secret societies, government conspiracies, cults, ghosts, EVPs, ancient artifacts, strange facts, odd sightings or just the plain unexplainable. Dinosaurs in today’s world have completely sold out. Instead of gutting each other in magnificent toothy battles, they do boring things like chase after their Jeff Goldbloom-kidnapped babies. It’s enough to convince you they’ve all been neutered. Now don’t fret, any dinosaurs that are reading this. Your reptilian-equivalent of testosterone can be restored in our eyes if you ravage a rhino or something. Normally when we talk about giant reptiles in this column they’re in the form of lizard-men who jump all over people’s cars, and drag human women into caves where they’re forced to lay eggs, and then bury them on a beach close, but not too close, to the ocean. Today, however, our story is 100% based on actual science and guaranteed non-fiction! The dino was called Kasai Rex for this reason or that. As for whether or not said servant ever corroborated the story is unknown. We have a feeling that he definitely did though. Believe it or not this isn’t the only time a T-rex has been spotted in Africa. A very similar story was told in a magazine that same year (1932). What’s more – in both stories pictures are said to have been taken. The one accompanying this article is from one of those encounters, but we’re not sure which. Obviously that picture looks like a still from King Kong or something, but since we’re pretty sure the giant ape film was a documentary, that really doesn’t diminish from the pic’s authenticity. And there you have it. As of 1932 at least one T-rex was still roaming the African wilds, so next time you’re on safari you might consider covering yourself in urine. After all, that’s how the kid survived so long in Jurassic Park 3. You shouldn’t mock. The Burrunjor of North Australia is just as tantalizing, if not more. It’s known to be a smaller version of the Tyrannosaurus, ambushing and killing crocodiles, probably by pouncing on their backs and ripping them up. 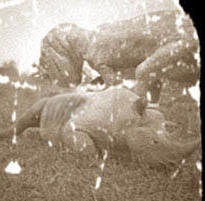 Very similar to the Kasai story with the rhino being attacked. The aboriginals fear it for very good reason. I would dare any big shot hunter to go after that thing. Well lets get one thing strait the kasai rex is a hoax while the burrunjor is much more believable. With the burrunjor there are plasters of giant three toed prints in the possession of cryptozoologist and farmers have also reported hearing its thunderous roars at night as and have even reported seeing the cattle half eaten the eventually left the area in fear of the beast. It is reportedly a grey bipedal lizard with sharp teeth it measures 25-30 feet long and stands about 10 feet tall. Also sightings of very similar bipedal monsters also come from Bolivia and New Guniea. So bottom line the burrunjor is a much more likely to be real than the kasai rex which like I said is most likely a hoax. okay i just have to put this out there, it is not only phycicaly impossible but also scientificly, the last reported Theropod died about “65 million” years ago, im pritty sure even though we dont know much about dinosaurs we know that “one” couldn’t survive “65 million years” so take this evidence and think now how can one of these creatures survive undictected for that long with out a large population, even with the other so called living dinosaurs it’s impossible for these “large” animals to go unnoticed at all for this long, and the tyrannosaurus never lived in Africa, it was only found on North Amreica and still only in the United States and some in Canada. If this was real, it would be more likely to be a Carcharodontosaurus or even an undiscovered/overgrown Allosaurus (similar to the Burrunjor being a possible allosaurid-the Australovenator). Tyrannosaurs took over Asia and North America, Carcharodontosaurs ruled Africa/South America. But the Allosaurs have been found in both Americas and in Africa. The color and speed portion must be recycled by the Jurassic Park 3 writers for the Spinosaurus. In another note, the monitor lizard picture (if it wasn’t an obvious fake) might be more factual, due to the African locals claiming that exists a giant lizard known to prey on rhinos.